Cat lovers are urged to back a major campaign seeking a change in the law on air guns to bring England and Wales in line with the rest of the UK. 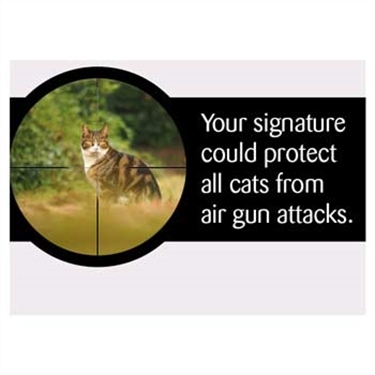 Cats Protection’s online petition seeks to encourage cat owners to back the campaign, and put pressure on the government to update the law on air guns. Both Northern Ireland and Scotland already have air gun licencing laws in place, and with a lack of UK-wide regulation, it has been reported that 90% of air gun attacks on cats happen in England and Wales. Northern Ireland led the way in restricting gun ownership and since 2004, anyone who buys, owns or uses an air weapon in Northern Ireland is now required to have a licence. Scotland adopted similar legislation earlier in 2017.